I'm very fond of Melanie Falick's Knitting for Baby: 30 Heirloom Projects with Complete How-to-Knit Instructions. It would probably bore any of you experienced knitters out there to tears, but it's ideal for a beginner. It teaches knitting, one step at a time and one chapter at a time. For example, the first chapter teaches the knit stitch. Then it says, okay, if all you can do is knit (no shaping, no color changes, nothing), here are some projects you can do. And they're actually decent things someone might want! There's a hat I've made that's done as a rectangle with no shaping, and it's actually adorable. Then the book takes you through the other basics: purling, shaping, colorwork, etc., with projects to do as you learn. It's really great, and I like the look of the book, which is very wholesome and earthy with nice pictures of real-looking babies. It, along with a couple of skeins of baby yarn and some knitting needles, would make a great gift for a pregnant mom. When I found out I was pregnant, I knew I wanted to knit for my baby. I also knew, however, that my mother would want to knit, too, and that her blankets and sweaters would undoubtedly put mine to shame. So I focused on hats and booties, which I've never known her to knit, and which are a specialty of mine, as I've made many in the past few years for pregnant friends. 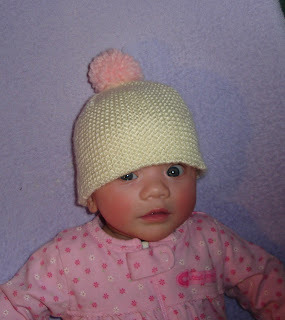 Two of my projects came out of Knitting for Baby. I used a nice soft baby yarn (I think it might have been Simply Soft Baby) trimmed with some leftover Lion Brand Jiffy. Yes, I know, acrylic is yuck, but I like it for baby items. Actually, I like it in general, so there. I made both of these projects over a couple of days while on vacation in Michigan with my parents. I really like this pattern; they're knit on straight needles and seamed, so I was able to avoid my hatred of knitting in the round. I've made them loads of times, and my only problem has been that they come out too big. So I modified the pattern. I really have no business modifying patterns, I have no idea what I'm doing 90% of the time, but this worked out. They're now perfectly sized for a 3-month-old; you can see my modifications on my Ravelry page. Again, this is knit on straight needles and seamed. It uses some very clever short-row shaping. It was quite lucky that I was with my parents at the time, because it was my first experience with short rows and I was a bit confused. Fortunately, my mother was in the middle of her sock knitting frenzy and was therefore a bit of an expert on short rows, so she taked me through it. The top of the hat came out a little bit hole-y, so I stuck on a pompom to cover it up. Plus, pompoms always jazz up baby items. Finally! A picture of Miss Rose in all her perfection. She is just beautiful, Anne. Thanks for noticing, Janeanne. We think she's not bad at all.